Take this Life Science Pre Test. The test serves two purposes. First - it gives an indication of how much you already know about the life sciences. Second - a comparison with the post test at the end of the year will show how your understanding of life sciences has improved. Science can be defined as a never ending search for better understanding. Our understanding is based on a set of (observable) facts and our understanding of those (observable) facts. A good scientist must be ready to accept new facts as they are discovered and modify what is "the best understanding" in light of these facts. Science is science, no matter what general topic is involved. Science in school is usually taught in classes that are limited to a general area of interest, but the methods of science are a part of our daily lives. All students of science should have an understanding of the basic science history timeline. Biology is the second year science class at Desert Vista High School. Biology is a "Life Science". This class will be a little different then what most students have grown accustomed too, being based around the concept of, less lecture and more discovery, asking questions and discussion, we will use computers and the internet to assist that process. This class will cover a wide range of topics from the cellular basis of life, to Earth's environment. Biology concepts that the class learns about depends on the amount of time available during the school year. Students are expected to improve their, knowledge of biology, work habits, skills with computer applications, and Internet researching skills during this school year. Check the weekly outline for current assignments and pace of class. Most biology concepts will be discussed together in class, but not all. Asking questions is a very important part of this class as students investigate the different concepts it is critical that students ask questions whenever needed. Students' grades in this class are determined by the students performance while participating in all of the classes activities. Biology Notebook: Much like a scientist and other professions it is important to be organized and keep record of your work. When scientists make important discoveries, their work and experiments must be able to be reproduced by others. The only way to do this is by following the original records of the work. It is the students responsibility to keep a well organized biology notebook. Students will find that an organized notebook will benefit there success. Very Important Student must have a username and password for internet access at school, without this students will be unable to complete this class. First Create a directory (folder containing docs. & other files) on your school account server space and name the folder "Honors biology". It is also good to copy this folder onto a home computer and or a portable USB mini drive. right click and choose "New" then "folder"
folder will appear, type in name for folder "Honors biology"
Create and save a word document called "passwords"
Use only small-case letters when naming files. Begin each file name with the first letter of your first name. Follow this with your last name. Follow this with the name of the assignment. · (example) If student Jon Doe is saving a file (assignment) from unit 1 section 1 Intro to biology, part a the file name would be - jdoe1.1a, plus the appropriate file extension (doc, ppt, gif, etc). · It is ok to have files with the same name, as long as they are different file types - such as doc, ppt, htm, or gif. 1. Each student must have their own username and password and demonstrate that they are able to log on to the school server. If this is not the case you must go to the library and set up your account. Do you have a username and password? 2. Use the directions provided on this web page and set up a directory/folder for biology on the school server and if possible a mini/thumb/portable USB drive. If you have a home computer you should do the same on that computer. What would the file name look like for this assignment? Save this assignment to your biology folder. 3. Create a new word document named "passwords & emails" and save it in your biology folder. You will use this later to save all your passwords in just in case you forget them. 5. Scroll to the top of this page and click on the Quizstar link. You will now sign up to take online quizzes for this class. Start by clicking on sign up. Follow the directions (make sure to save your username and password). Search for a class by teacher name: Gerry Foster. Find your class period and submit. 6. You will now sign up to use your text books online web page. Use this link to go to the student resources page and find the link to your biology text book, click on link and find your text (pelican book). Enter the site and begin the first time user registration. Your instructor will provide you with needed pass codes. When finished log into the text web page and make sure the information is displayed in the upper right corner (name, class period, teacher). 7. Using a computer print out the class outline/syllabus which contains the class procedures and rules. Also fill out the student information document which is part 2 of the class outline/syllabus. Get signatures on the student information document and bring to class to turn in. d. 4. Your biggest accomplishment so far in your life. e. 5. One the back: A future goal that you have set for yourself. 9. The following problem relate to your knowledge of technology. a. Anyone can put anything on the web. When first viewing a web page, how would you determine if the web page is a credible source to use? b. Pick one of the types of software we will be using in class that you are familiar with and give a brief explanation of its benefits and what it is used for. 10. Use the DV biology homepage (index page) to help you answer the following questions. Summarize the rules for this class? Why are they so important? Briefly summarize the goals for this class as stated on this web page. What must be done in order to earn 100% on an assignment? Briefly describe a weekly outline and its importance? Summarize how scoring rubrics are used on this web page. Starting from the DV biology home page (index page), list the "Mouse clicking" steps you would follow to get to assignment 1.3c? What is the title of this section? 1. Use the following information to answer the questions below the chart. Your lab group has been given the task of determining the effect of alcohol on reaction time in humans. The test will consist of a computer program that presents an X in the middle of the screen. The participants must press the spacebar on the keyboard as soon as possible after the X appears. The computer's internal clock will measure the amount of time between the appearance of the X and the pressing of the spacebar. Your group decides to use 30 male volunteers, split equally into the three groups in the data table below. A. Which hypothesis is best supported by the data presented? a. Not everyone consumes alcohol. b. Amount of alcohol consumed increases reaction time. c. Age influences reaction time. d. The decrease in reaction time is caused by the consumption of alcohol. B. To correctly plot these data, you would place ___ on the X-axis and ___ on the Y-axis. C. Which one of the following represents the control group for this experiment? D. In the described experiment ___ is the independent/experimental variable and ___ is the dependent/measured variable. Laboratory safety is important in all science classes. Life sciences use some equipment that other sciences do not. The proper use of equipment like microscopes will be covered soon; however, you should review the use of basic lab equipment. Biology Class includes basic information from most of the life sciences. this is done by a process known as the Scientific Method. Check out these items to help develop your knowledge of the Scientific method. 1. Explain in your words what is meant by, "Everyone is responsible" on the lab Safety page. 2. When doing dissections, there is always a danger of being cut with a scalpel or any other sharp object. What safety procedures are you to follow if your lab partner is cut? 3. Where is the eye wash station located in the DVHS science lab? 4. How long should your eyes be flushed with water if a chemical is splashed into them? 5. Broken glass is the most common accident to occur in science labs. What are you to do if glass is broken at your lab station? 6. What type of fire extinguisher is located in the DVHS science lab? 7. What is a graduated cylinder use for? 8. What is a mortar and pestle used for? 9. What type of scientist specializes in the study of fish? 10. Why might a Pathologist research be important to you? 11. 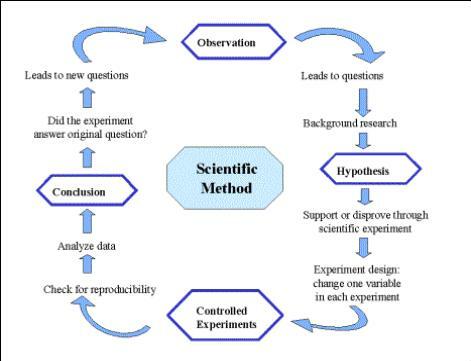 What are the basic steps of the Scientific Method? 12. Summarize the three factors that are essential for good experimental design. 13. Compare and contrast the two types of experimental data? 14. How does a scientist experimental result finally make it into publication? Why is this important? 15. Get some practice with scientific words and what they mean by completing this page: Language of Science Attach it to this assignment. 1. You have the chance to interview one scientist or person that is in or uses any of the listed life sciences linked above. Write down at least 5 specific questions you would ask that person about his/her profession. 2. Use your communication skills and this link, ask an expert, to find an expert linked to your chosen life science and to get answers to your questions. You may find that some professions use more then one of the life sciences listed. Your answers will be due in 2 weeks. You may also interview a local person in or linked to one of the life sciences above. Make sure to include the source information: name, title, profession, place of employment, method of communication with the person. Possible communication methods may include forums, email, videoconference, interview, pod cast. Important: Use proper etiquette when corresponding. Do not give out personal information. 3. If your expert is local: see if they would be interested in coming in to talk or give a demonstration for the class or classes. An experiment is conducted to test a hypothesis.